Interchangeable with Singer Metal Rotary Hook Model 206 306K 306W 319K 319W 320 Sewing Machines, Interchangeable with Singer 2029, HPx13, SY2029 needles are almost identical. With a slight timing adjustment the needles can be used. 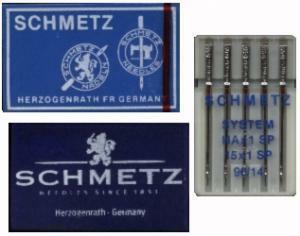 Note: Schmetz 206x13 needles are only available in sizes 12 and 14 only. Schmetz S206x13 will continue to be available in sizes 12 and 14. This 206x13 needle in size 16 is no longer being produced by SCHMETZ. Organ 24x1 needles are almost identical. With a slight timing adjustment Organ 24x1 needles can be used, especially if you have to use size 16 only for heavier fabrics. Found needles for my old Singer machine. Great! Purchased qty of 100. Fast shipping to Canada, Good selection of products, will buy from again. I have always had great service from your company. Thank you!